As you rebuild your old motorcycle’s engine, you’ll need to replace the old gaskets. Gaskets works my expanding slightly when oil gets to them. This prevents oil leaks and seepage between engine cases, covers, and blocks. OEM Gaskets: You can find individual, OEM gaskets for your bike. These are usually more expensive but will be a perfect fit. Aftermarket gasket sets: For many old bikes you can find complete aftermarket gasket sets. These will include all of the gaskets you need for a full engine rebuild. They are significantly cheaper than buying all OEM gaskets, but may not always be a perfect fit. 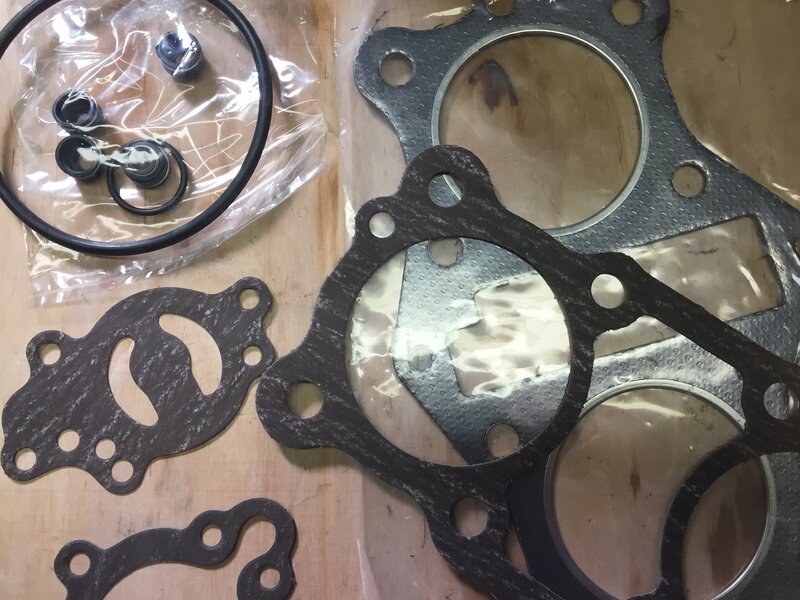 Home-made gaskets: If you’re brave and can get your hands on some uncut gasket material, you can make your own gaskets. You’ll need to trace either the part’s surface or and old gasket and cut it out. A hole punch can work well for the bolt holes. When installing paper/composite gaskets, you can use a small amount of grease to keep them in place and allow for easy movement if necessary. You do not need to apply liquid gasket cement to your paper gasket surfaces. Only do so if specified in the shop manual or if there is a big knick or divet in the engine case surface. For sealing crankcases or surfaces that call for liquid gasket maker, try to avoid a silicon-based gasket cement. If you use too much and it enters the crankcase, it can harden, ball up, and clog oil passages. ThreeBond Liquid Gasket #1194 is a good choice for sealing engine crankcases. Removing old gasket material can be a pain when rebuilding a motorcycle engine. When you put everything back together, you’ll want the gasket surfaces to be completely clean and smooth. Gasket remover spray or liquid can help break down some of the material to make it easier to remove. Whenever removing old gaskets, be sure not to scrape the engine cases with any hard metal that could knick them. If you do use a razor blade, you must scrape parallel to the surface making sure NOT to gouge the metal. Remove everything you can that will come off easily. Apply gasket remover or solvent to the remaining gasket material or try soaking the part in warm water and dish soap. With a straight razor blade (the kind that fit box cutters), carefully try to scrape/slice away more gasket material. Be very careful not to gouge or scrape the metal gasket surface itself as this may lead to oil seepage when the bike is running. Remove the remaining gasket material with scrubbing pads and your razor blade. Repeat as necessary until most of the old gasket is removed.